Autumn Leaves in the Vineyard! 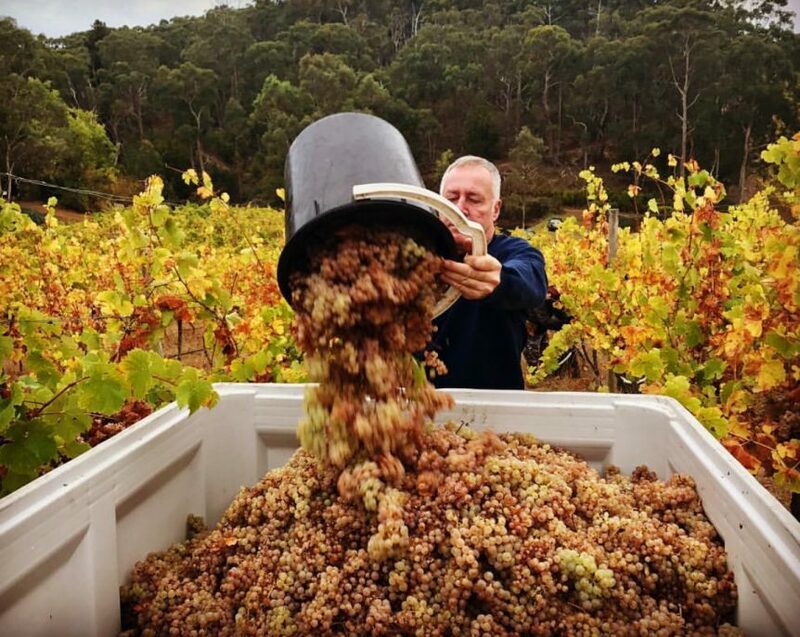 We LOVE Autumn in Australia, it has a magical diversity that evokes new beginnings, it displays chromatic and crimson colours, there is a shift in temperature, wine vines display heavy bunches of fruit and Vintage 2018 is well and truly underway. It is a great time to rug up, grab your camera and enjoy the flavours of autumn. Our wine regions are ablaze with vibrant shades and bustling with activity whilst the winemakers prepare for the cooler months ahead. Zoom to the Adelaide Hills, a region gaining fame and accolades all over the world. Zoom in even further to Mt. Lofty Ranges. A small, boutique gem, producing award winning wines that are being noticed and compared on the world wine stage. This picturesque steep sloping vineyard is located in Lenswood, a sub region of the Adelaide Hills Wine Region. Established in 1992, the vineyard has 19,000 planted vines consisting of Sauvignon Blanc, Riesling, Chardonnay and Pinot Noir. Sharon & Garry’s mission is to create cool climate premium wines from the distinctive terroir of the Lenswood area and believe minimal intervention in the vineyard is the key to enable distinctive fruit flavours to shine through. Their focus is on creating single vineyard, estate grown wines which enhance the boutique nature of the vineyard and cellar door experience for visitors. All aspects of their wine growing and wine making is approached with a deep sense of sustainability and care. All vines are hand pruned and all grapes are handpicked, one of only a few wineries still employing these age-old practices for the entire vineyard. Typical of cool climate characteristics, Mt Lofty’s soil is rich with white quartz and sandstone, adding to the mineral crispness of the wine’s flavour. Mt Lofty Ranges Vineyard is known for their Shiraz – described as having an explosion of spices, an excellent wine that is juicy and ripe. However, one of our greatest discoveries, is their Riesling. The wines accolades are many but most recently and notably, their 2016 Riesling won GOLD at the 2017 Royal Melbourne Wine Show. It has an incredibly enticing nose with light floral aromas. The palate however is drier suggesting citrus with hints of musk, leading to a long, lean and elegant finish. This is one of our favourite wines, it is distinctive, creative and flexible and paired beautifully with spicy, zesty seafood, think Vietnamese or Thai. Or, why not try what we’re having on this wild and windy Autumn night, Spicy Pork Tenderloin Taco’s with Avacado Salsa ……. Mmmm, deliciousness right there!